Evening all! After taking part in last night's #BBloggers chat, I realized how many people just can't live without their skincare products and it inspired me to share my short but sweet evening skincare routine with you. It only consists of four small products, but it works for me and my skin has benefited crazy amounts since these skin superheroes entered my collection. And the best thing about it? it barely takes five minutes! I firstly use my Omorovicza Cleansing Foam in conjunction with my Ultimate Skin Spa System (not pictured but you can check my blog post on it here). At night time this cleanser is perfect for removing all of my makeup quickly and easily without that 'I just scrubbed my face off' feeling that I seem to get with makeup wipes. This is just a sample size and due to its high end pricing I probably won't buy it again, but it's good to indulge once in a while. My current serum of choice is the Boots Botanics Radiance Concentrate Serum, at the incredible price point of only about £4 you really can't go wrong with this product. My skin feels more plump and hydrated after using this for the past three weeks and for the price, the results are amazing. However I do want to invest in a more luxury serum and see how that benefits my skin too. To moisturise I use the Cetaphil Moisturising Lotion for sensitive and dry skin; I've been using it for months now and it simply does what it says on the tin, my skin feels moisturised 24/7 due to this. Finally, at night time I like to use a thicker lip balm to leave my lips smooth as a baby's bum for the morning - after all, I can't be having chapped lips in autumn lipstick season! The Elemis Lip Revive Balm contains Shea butter and olive oil and is always a treat to use. There we have it, this little routine I've come to know and love seems to suit my skin and has done great things for it. 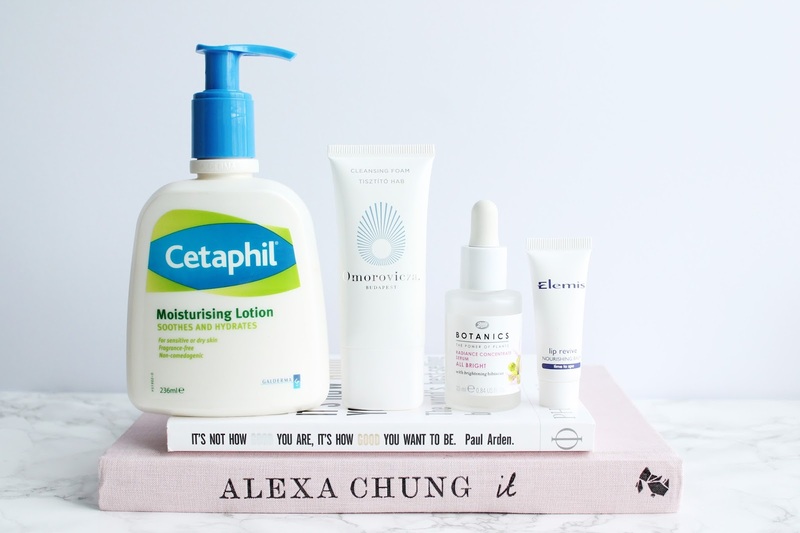 But as winter is coming aka the dreaded dry skin season, my skin may be in need of some extra TLC in the next few weeks so..
What skincare items do you love and recommend for hydrating the skin?